What gifts will you bring? The Three Kings Society celebrates and honors friends of Holy Family Hospital of Bethlehem Foundation who have made a commitment to the future of Holy Family Hospital by including the Foundation in their estate plans. 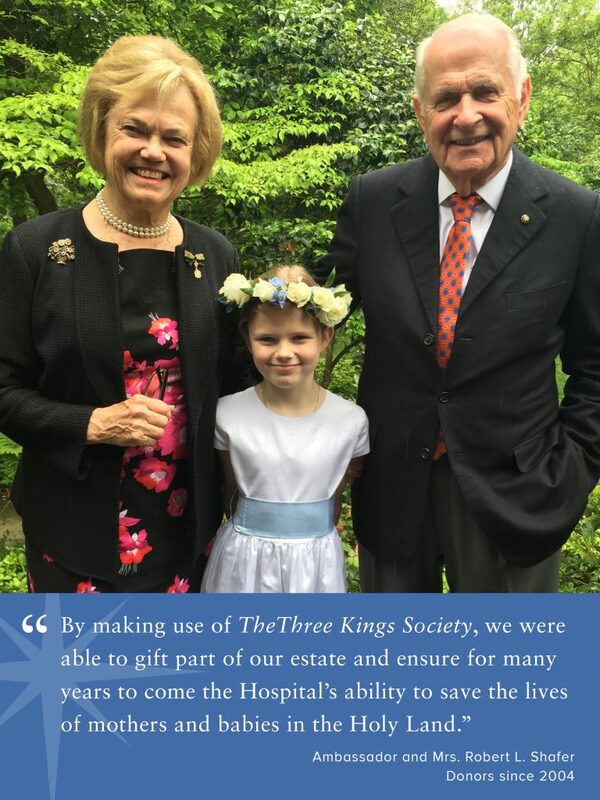 By becoming a member of The Three Kings Society, you will secure your role in the Hospital’s lasting mission, as it continues to deliver life, peace, and hope just a mere 1,500 steps from the birthplace of Christ. A planned gift affords your considerable flexibility to ensure that your contribution speaks to your philanthropic passions and priorities. We want to make sure the legacy you create is something meaningful to you. All gifts now and in perpetuity to Holy Family Hospital of Bethlehem Foundation are fully tax deductible. It is always advisable to consult with an experienced estate planning attorney about drafting a provision for your legacy giving. Gift a percentage of your will or trust. Gift a percentage of your appreciated securities or a percentage of common stock. Gift a percentage of your life insurance. Gift a percentage of your work benefits. To learn more about becoming a member of The Three Kings Society, please contact us at (202) 785-0801 or fill out the interest form below.